The 2012 Olympics in London will not be immune to cyber attacks, but the UK is prepared, says Cabinet Office minister Francis Maude. The 2012 Olympics in London will not be immune to cyber attacks by those who would seek to disrupt the Games, says Cabinet Office minister Francis Maude. "The Beijing Olympics saw 12 million cyber security incidents during their Olympics," he said during a visit to the International Centre for Defence Studies in Estonia. "We have rightly been preparing for some time - a dedicated unit will help guard the London Olympics against cyber attack – we are determined to have a safe and secure Games," he said. Maude said that during his visit to Estonia, he would be discussing ways in which the two countries can share their experience in increasing business and government's resilience to cyber attack. Making the UK as a whole more resilient to cyber attack and better able to protect its interests in cyberspace, is one of four objectives set out by the UK Cyber Security Strategy published last November. The other aims are to make the UK one of the most secure places in the world to do business in cyberspace; to build the UK’s cyber security knowledge, skills and capability; and to shape an open, vibrant and stable cyberspace which the public can use safely and supports open societies. "The UK, like Estonia, does not treat cyber defence as a solely military issue," said Maude. Instead, he said, the UK puts international co-operation at the heart of its approach and recognises that improving cyber security requires a multi-faceted approach involving a number of government departments and agencies working in close partnership with industry and academia. "Government involvement needs careful consideration. The internet has flourished because it has been shaped by its users, not by governments," said Maude. Partnership with industry is essential, he said, and highlighted that the UK government is raising awareness in businesses of the potential threat to reputation, revenues and intellectual property from cyber attack. Maude said the UK government has committed to a new Cyber Crime Unit in the National Crime Agency by 2013 that will deal with the most serious national-level cyber crime. The unit will be part of the response to major national incidents, drawing together and enhancing the work of the e-crime unit in the Serious Organised Crime Agency (SOCA) and that of the Metropolitan Police eCrime Unit. A Cyber Specials pilot programme has also been approved, which involves bringing in people with specialist cyber skills from outside law enforcement to help the police tackle cyber crime. "We all want to get ourselves into the position where law enforcement is beating cyber criminals, businesses and citizens know what to do to protect themselves, and threats to our national infrastructure have been confronted," said Maude. To do this, he said, requires a multi-stakeholder approach to internet governance – resisting state intervention that would stifle growth and the free exchange of ideas. "By building mutual trust and partnerships at home and abroad I believe we can find right balance between freedom and regulation and ensure the UK, Estonia and the world will be able to tackle the dark side of cyberspace and enjoy the still emerging benefits," Maude said. 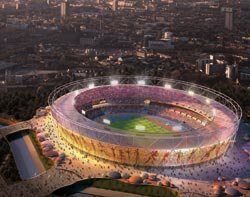 London 2012 CIO Gerry Pennell told Computer Weekly earlier this year that organisers are due to stage a series of technical rehearsals for the IT supporting the Games this month, which will include simulated cyber attacks to test the resilience of the computer systems.